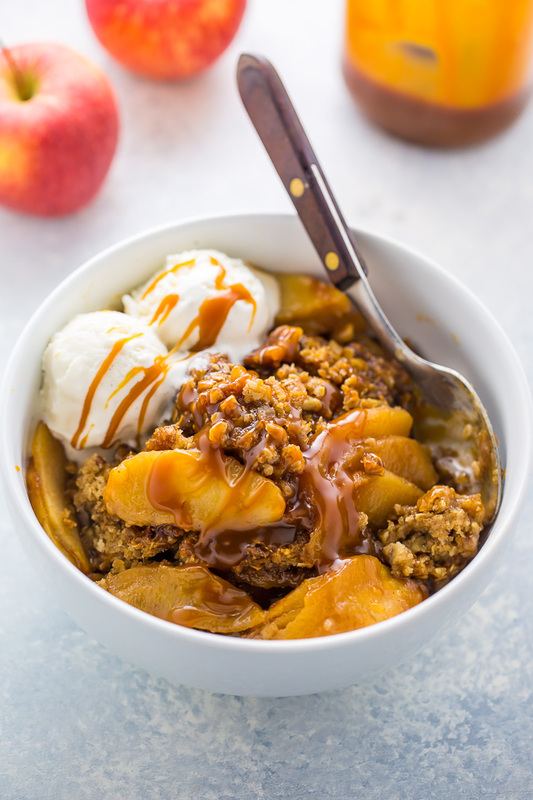 There’s nothing like a warm bowl of Salted Caramel Apple Crisp! And yes… you can use my easy salted caramel sauce for this recipe! Winter is in full swing here in the Hudson Valley, which means I’m craving all of the cozy things all of the time. Fuzzy sweaters, scented candles, hot showers, mugs of coffee, and a warm bowl of salted caramel apple crisp can make even the most miserable day more manageable! One of the best things about my apple crisp with salted caramel sauce is that it’s SO easy! No crust to roll, no dough to chill, no pie to cool. Simply slice your apples, make your topping, bake, and serve! You may use homemade salted caramel sauce or store bought salted caramel sauce for this recipe. Don’t slice your apples too thin or they’ll become soggy as they bake. Medium-sized slices will yield the best results. 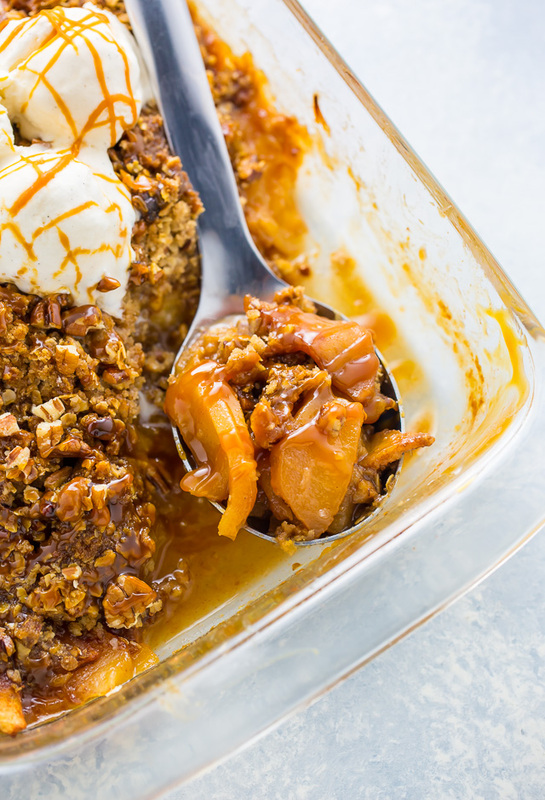 This salted caramel apple crisp is best served warm, the same day it’s made. However leftovers will keep, covered in the fridge, for 3 days. I love to use a variety of apples in this dessert, but just one type will also work. I find granny smith, jonagold, mutsu, and braeburn are all great baking apples. 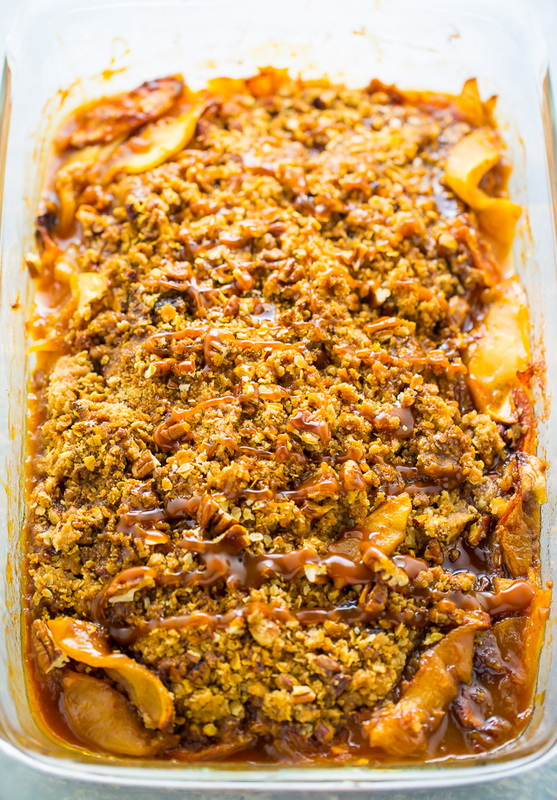 An easy recipe for Salted Caramel Apple Crisp! So good with a scoop of vanilla ice cream! Lightly grease a 9x13 inch baking dish. Place the sliced apples in a large bowl and toss with the lemon juice; set aside. In a medium bowl combine the flour, granulated sugar, cinnamon, and nutmeg. Sprinkle this mixture over the apples and toss well to coat. Pour mixture into prepared baking dish and set aside while you make the crumb topping. In a large bowl combine the flour, brown sugar, oats, pecans, baking powder, nutmeg and cinnamon. Using a pastry blender or two forks, cut in the cold butter until the mixture resembles a coarse meal. Sprinkle over apple mixture. Bake in preheated oven for 45 to 50 minutes, or until the crumb is golden and the apples are tender. Drizzle with salted caramel sauce and serve warm, with flaky sea salt and ice cream, if desired. I love making homemade apple crisps! Using salted caramel in it is an amazing idea! I love making salted caramel or regular caramel. Really, both ways are super yum. Happy Baking in 2017 with a great big side of boogie boogie. Apple crisp and apple pie are my favorite things to make and this recipe sounds great! Thank you for the post! wow im salivating! sometimes i want to lick my phone when i see your photos just sayin! xO! Now that is a great flavour combination. I just made your recipe, and nearly had a full scale war in the house with the kids all wanting second helpings. I’m going to have to double the quantities next time. Hi June! You’ll want to preheat your oven to 375 degrees (F). The full 1/2 teaspoon of cinnamon goes in – that was my mistake! Thank you for catching it 😉 I hope you enjoy the recipe! Looks amazing! Could you freeze this? Save for a cold, lazy night? Another solid dessert from you! Thanks!